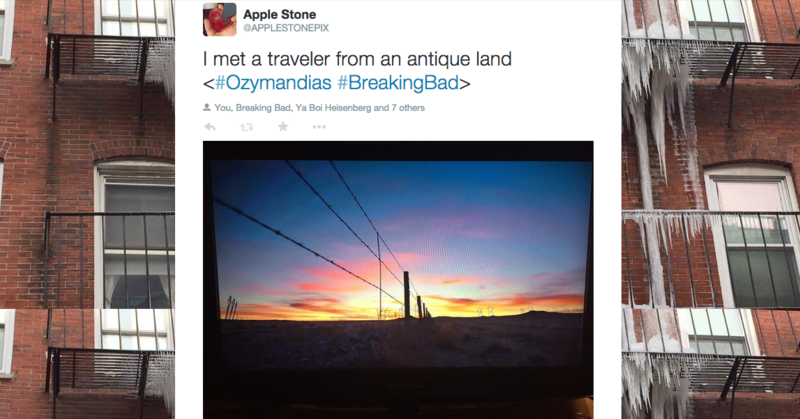 Being enormously impressed by Breaking Bad's OZYMANDIAS promo for the Final Season, which managed to be spoiler-free, unbelievably intriguing, and collected some jawdroppingly gorgeous shots of the New Mexico landscape--as only the team behind Breaking Bad could--while also listening to Bryan Cranston intone the sonnet "Ozymandias" by Percy Bysshe Shelley. I mean, the thing is a work of art unto itself. Which is why we decided to create a Fumetti Serial capturing the unique beauty of this trailer, in fourteen tweets (corresponding with the lines of the sonnet).